The Truth and Reconciliation Commission defines reconciliation as the “ongoing process of establishing and maintaining respectful relationships”. This month, we are focusing on truth & reconciliation. The Truth and Reconciliation Commission (TRC) has released a final report. Dr. Janet Smylie offers the following 4 “field tips” for people wanting to be part of the commitment to reconciliation with First Nations, Inuit, and Métis people of Canada. If you are interested in reading more on the tips, visit the 2015 Editorial in the Canadian Journal of Public Health by Dr. Janet Smylie here. Tip #1: Read the TRC report entitled Honouring the truth, reconciling for the future: Summary of the final report of the Truth and Reconciliation Commission of Canada. Tip #2: Engage in self-reflection. Think about how we continue to use approaches that have colonial beginnings. Tip #3: Listen, learn, and locate. No one can learn everything there is to know about Indigenous peoples. Learn to locate yourself, your world views, and your knowledge base. Tip #4: Challenge yourself and your family, friends and colleagues to come up with some concrete ways of responding to the TRC’s Calls to Action. To read full editorial Approaching Reconciliation: Tips from the Field, click here. 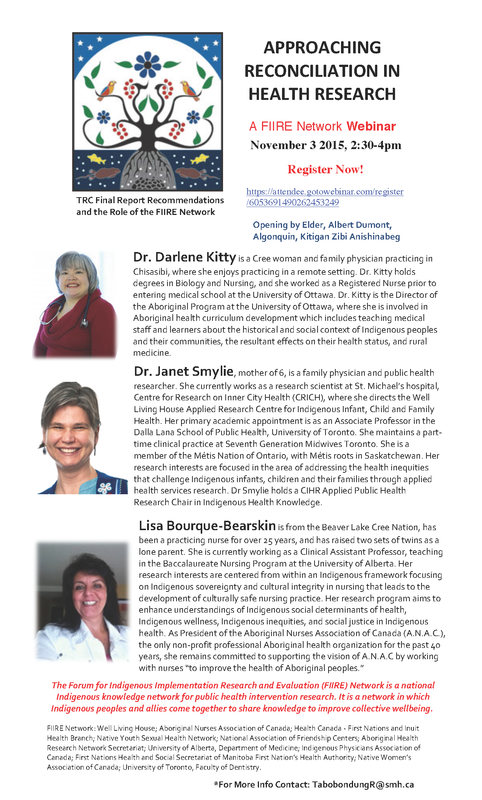 To watch a webinar on Approaching Reconciliation in Health, click here. The Forum for Indigenous Implementation Research & Evaluation (FIIRE) Network recently hosted this webinar. To see an overview of the webinar presenters, see below.